UC Davis Solar Decathlon team members at the Structural Engineers Association of Central California awards ceremony on June 12 in Sacramento. From left to right, Tom Ryan (project manager), Frank Loge (faculty lead), Norman Scheel (consulting expert), and Shahab Faghri (engineering manager). 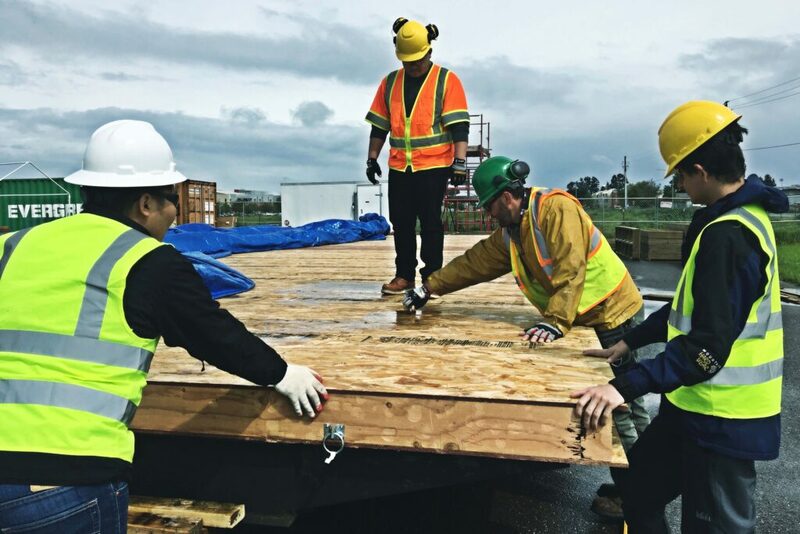 On June 12, 2018 the UC Davis Solar Decathlon team, led by Professor Frank Loge in the Department of Civil and Environmental Engineering, received the Excellence in Structural Engineering Award from the Structural Engineers Association of Central California (SEACC) for their work designing and building OurH2Ouse for the 2017 U.S. Department of Energy’s Solar Decathlon competition. 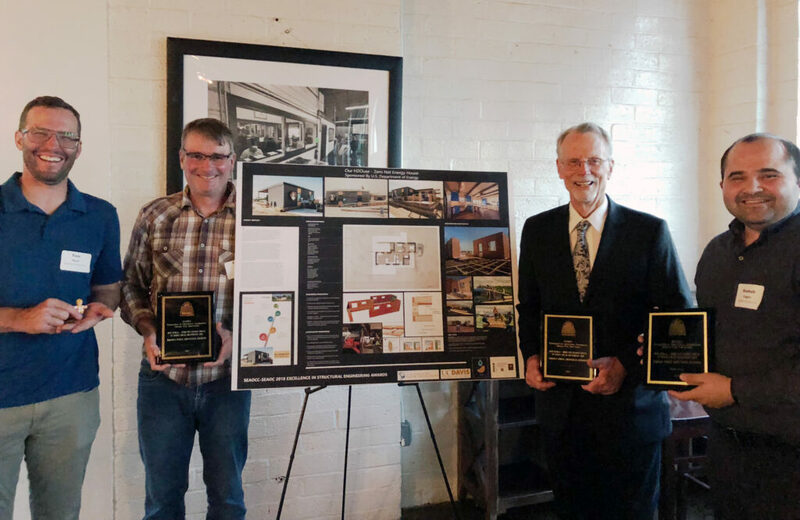 This annual award recognizes excellence in structural engineering and project work in Central California. The team is now eligible for the larger state-wide Structural Engineers Association of California award, which will be announced in September. OurH20use at the 2017 Solar Decathlon competition in Denver, Colorado. 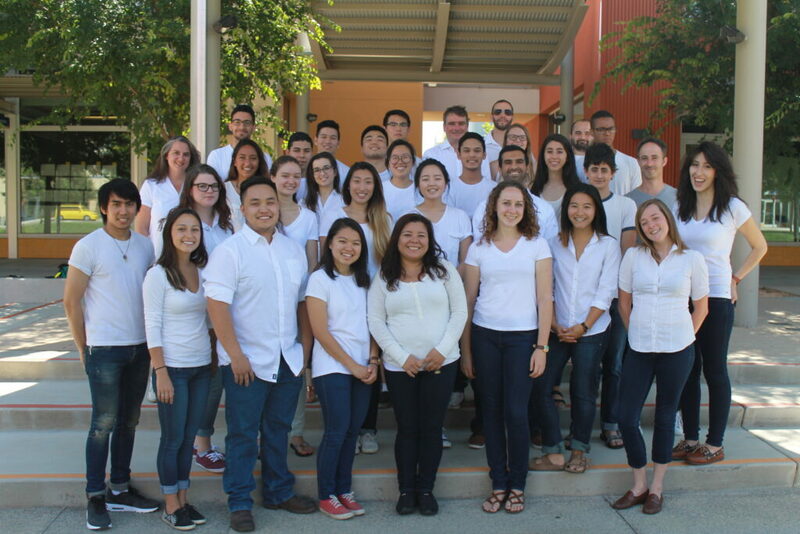 Members of the UC Davis Solar Decathlon team. For many years, California has suffered from cyclically-occurring droughts. OurH2Ouse (pronounced “our house”) was designed to address this critical issue through three main design and engineering pillars: drought resilience, education, and inclusiveness. Drought Resilience is promoted through community-level systems of energy and water management. Water flow rates are monitored in all of the water lines and collected data is compared to customizable water budget goals. In addition, reclaimed and/or sustainable building materials are used throughout the home to lower the overall carbon footprint of the house and improve the home’s long-term energy and water efficiency. Education is achieved by influencing occupants, both consciously and unconsciously, to minimize their water use through exposure to physical and virtual feedback systems. Inclusiveness is encouraged through the home’s affordable construction cost (about $175/sf) and its open and adaptable interior and exterior ADA-compliant floor plan that can fulfill the needs of a 1 to 4-person family, as well as a household of student renters. Innovative educational elements are incorporated throughout OurH20use, including LED displays at every faucet, that enable residents to monitor and control their water use. A modular design for easy transport, quick assembly and disassembly, and with minimum site disturbance. A support system that enables installation of a seismic base isolator to protect the home against earthquakes. Structurally Integrated Panels on the floor and roof that enable quick construction and are joist-less and radiant floor compatible. 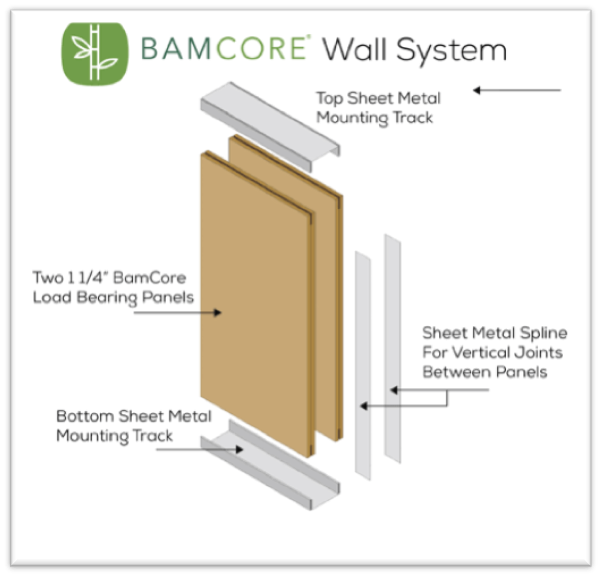 A BamCore panelized wall system made from bamboo, which has no traditional framing studs, a smaller carbon footprint, and uses less water than traditional wood framing. In addition, this wall system eliminates the need for exterior sheathing and drywall. A patented cam lock system for tying panels together, which virtually eliminates all floor and roof framing. Exterior walls that have only 2.5% of the wall cavity occupied by wood studs, as compared to 20% of traditionally framed walls, which makes installation of rough utilities much easier. Thermafiber mineral wool for wall insulation, made from alternative recycled materials like rock and furnace slag byproduct from the steel industry, saving valuable natural resources. An open and adaptable interior and exterior ADA-compliant floor plan. Attractive and comfortable outdoor spaces that minimize the need for indoor conditioned space, which include retractable awnings that provide shade in the summer heat and collect rainwater in the winter. Greywater and rainwater collection and storage to eliminate potable outdoor water use. UC Davis team members working with BamCore onsite. Diagram illustrating the key components of BamCore. OurH2Ouse has received a lot of interest. After the Solar Decathlon competition, the house was sold to the city and county of Denver to be integrated into a Habitat for Humanity community, where it will go on to serve a valuable purpose and data will continue to be collected on the home’s performance.